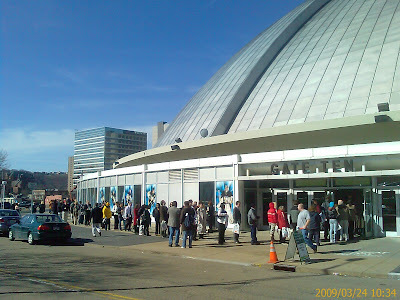 With about 1,500 job seekers coming to our job fair at Mellon Arena on March 24th, the 45 companies and schools in attendance are reporting one of the best qualified groups of job seekers seen in years. We knew this was the largest attendance we have had since 2003. This also coincides with the last time Pittsburgh had seen year over year job losses that approach the levels reported for February. The Pittsburgh Metro unemployment rate rose to 6.9%, up from 6.5% in January. The last time Pittsburgh had a rate this high was 1994. The state unemployment rate was 7.5 % in February and the national rate was 8.1%. With a diversified economy, the Pittsburgh region has been better off than in past decades when steel and manufacturing accounted for a much higher percentage of jobs. Healthcare and education in particular have helped mitigate the effects of this recession buffering our area from the brunt of job losses like those seen in southern and western states. Also contributing to the relative strength of our economy is a housing industry that, because it was never part of the national housing bubble, has not seen the kinds of declines in housing values seen elsewhere. Pittsburgh area recruiters that we speak with, though not as pessimistic as over the past three to six months, are still showing extreme caution in their hiring plans going into spring. Until they see a sustained improvement in economic news, job losses in our area will continue to mount. On the plus side, we are starting to see a slight uptick in the search for sales people in various industries. For more details on the February Pittsburgh job market see the Pittsburgh Tribune Review article here. For more insight into what the numbers mean visit Harold Miller's Pittsburgh's Future blog. What Should You Expect From a Job Fair?